I don’t know about you, but for me, the new year meant some new resolutions, one of which is eating healthier and getting in better shape. I’ll be totally honest, while I couldn’t be happier having a boyfriend as great as Sean, relationship bliss has come with one little drawback: weight gain. It’s not his fault, I’m the one putting the food in my mouth, after all, but dinners out, dinners in and baking goodies for his enjoyment have not left me untouched. Hence, my decision to get serious about taking the weight off this year. I’ve tried all sorts of diets in the past: calorie counting, Paleo, clean eating, IIFYM, etc. but none of it was working. Instead of continuing the definition of insanity, I decided to try a new tactic this year: hire an online personal trainer for diet and exercise plans (in case you’re curious, I gave my business to Josef Rakich after seeing his ripped physique on Instagram). What I received was a very basic meal plan: chicken breast, egg whites, spinach, berries, etc. – the no-duh health food, but at this point, getting back to basics is probably what I need. It makes meal planning for the week easy, I just need to spice up my chicken breast and turkey to make them more palatable. This has been a great exercise for me: how do I make something healthy, but still tasty at the same time? The answer is spices, fresh flavors and a little bit of fat to make it all gel together. So, in honor of my new year’s resolution (and maybe yours too), I present to you: my baked lemon thyme chicken breasts recipe. It’s simple, it’s flavorful, it’s good for you. In a small bowl, mix together the garlic, thyme, olive oil, lemon rind, lemon juice, pepper and sea salt. Place the chicken breasts on a baking sheet lined with foil and distribute the olive oil mixture among all six, rubbing all over the chicken to get the flavor everywhere. Bake for 35 – 40 minutes or until chicken is cooked done. Let chicken rest 3 – 4 minutes and serve alongside roasted vegetables or any other sides you might desire. 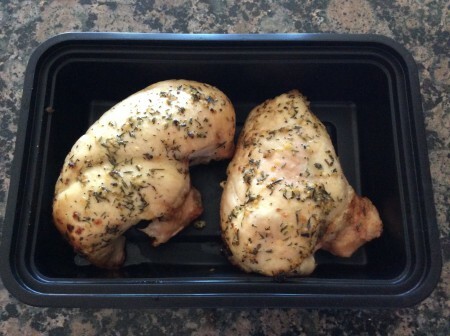 These little lemon thyme baked chicken breasts are destined for my lunch box this week. This post is part of the monthly link up party Our Growing Edge. This event aims to connect food bloggers and inspire us to try new things. This month is hosted by Francesca from Fearless Kitchen. This entry was posted in Entrees, Paleo, Recipes and tagged Baked Chicken, Chicken, Chicken Breast, Entrees, Healthy, Lemon, Lemon Chicken, Lemon Thyme Chicken, Our Growing Edge, Paleo, Recipes, Thyme on January 21, 2015 by Paige N..
Great submission to Our Growing Edge! Good luck with your eating plan this year. For me, I’m just aiming to eat whole foods. That includes the things on your list. I prefer chicken thigh over breast, I wonder if there is any difference nutritionally? Thanks! I totally agree about the whole foods – much more of those for me too. The biggest difference between chicken breasts and thighs is the fat content. Thighs are all dark meat and have a higher fat content than breasts. lol. That must be why I love it so much.